As many as 22 million Americans over the age of 40 have cataracts, while more than 2 million adults 50-years-old and older have advanced age-related macular degeneration, a condition that can lead to blindness, according to 2011 information provided by the American Academy of Ophthalmology. You may be able to help prevent or delay the onset of these and other eye problems with a high intake of certain nutrients, including vitamins. 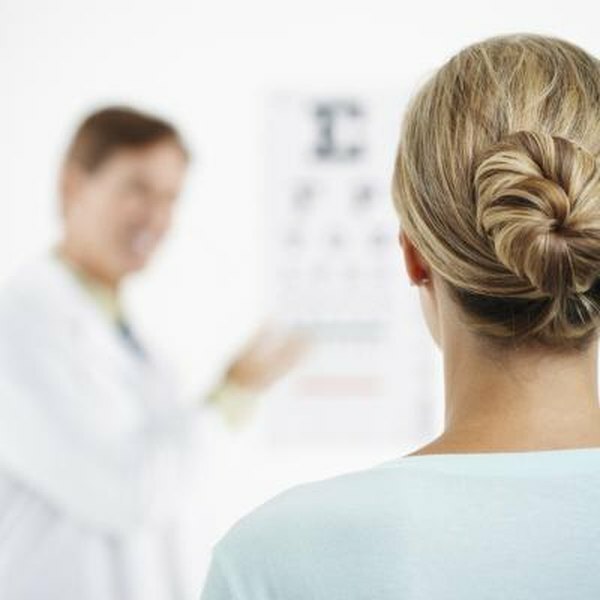 However, don't attempt to self-treat any eye condition with supplementary vitamins unless you are under the supervision of a doctor, as some have potentially harmful side effects and may interfere with the function of certain medications. A National Eye Institute study, known as the Age-Related Eye Disease Study, published in the October 2001 issue of "Archives of Ophthalmology" determined that people with age-related macular degeneration could lower their risk of irreversible vision loss by taking a combination of vitamins, one of which is vitamin C. In the study, the participants took 500 milligrams of vitamin C each day. The recommended dietary intake of vitamin C for healthy adult males is 90 milligrams daily, while women need at least 75 milligrams daily. Excellent sources of dietary vitamin C include citrus fruits, vegetables and fruit juice. Adults should have 22.5 international units, or IUs, of vitamin E each day. Most people get enough vitamin E to fulfill this requirement from foods including nuts such as almonds, avocados and vegetable oils. In the Age-Related Eye Disease Study, subjects took 400 IUs of vitamin E in addition to vitamin C, beta-carotene and zinc. The researchers theorized that vitamin E's strong antioxidant properties helped make it effective against macular degeneration. Taking supplemental vitamin E along with vitamin C may also treat uveitis, a condition in which one of the layers in the eye becomes inflamed and obscures vision. Your body needs vitamin A to produce rhodopsin, the receptors in your retina that allow your eye to react to light. Without enough vitamin A in your diet, you may be unable to see in dim light, a condition known as night blindness. A severe or prolonged vitamin A deficiency can ultimately result in corneal ulcers, scarring, and eventually, a complete loss of vision. Women need 2,333 IUs of vitamin A daily, while men require 3,000 IUs. You can avoid becoming deficient in vitamin A by eating plenty of fresh fruits and vegetables, particularly yellow or orange produce like sweet potatoes, carrots or cantaloupe. Beta-carotene is a compound that your body converts to a usable form of vitamin A. Participants in the Age-Related Eye Disease Study took 15 milligrams of beta-carotene each day. While vitamin D is most often associated with bone health, a study published in the April 2011 issue of "Archives of Ophthalmology" indicates that the higher a woman's intake of vitamin D from both food and dietary supplements, the lower her risk of developing early age-related macular degeneration. The reason for this may lay in the fact that vitamin D can help inhibit tissue inflammation and the development of abnormal blood vessels that contribute to the eye condition. Your skin synthesizes some vitamin D when you're exposed to direct sunlight, but good food sources include eggs, fatty fish such as salmon and vitamin D-fortified products like breakfast cereal or milk. Adults should aim to get at least 600 IUs of vitamin D daily.